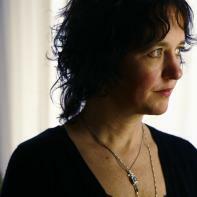 Laura Kasischke is the recipient of the National Book Critics Circle Award for Poetry, 2012. She has published eight novels, two of which have been made into feature films—“The Life Before Her Eyes,” and “Suspicious River”—and eight books of poetry. She has received fellowships from the Guggenheim Foundation, the National Endowment for the Arts, as well as several Pushcart Prizes and numerous poetry awards. Her writing has appeared in Best American Poetry, The Kenyon Review, Harper’s, and The New Republic. She lives with her family in Chelsea, Michigan and is an Allan Seager Collegiate Professor of English Language and Literature at the University of Michigan. This interview was conducted over the phone and transcribed by interview editor Monica Petersen. She said of the process, “Interviewing Laura Kasischke was such an engaging experience. I enjoyed reading from her novels, poetry, and short story collection. She was truly open to my questions and dug deep into her writing philosophy to give wonderful honest answers.” In this interview, Laura discusses associative poetry, her writing notebook, and what to do with an unsuccessful novel. Superstition Review: In If a Stranger Approaches You, “Memorial” is told through the voice of an angel statue for children who died in a fire. The story discusses the power of the statue in the town. What inspired you to write this piece? Laura Kasischke: Well I’ve seen many such memorials. I don’t think the story was really inspired by the idea of memorials though. I think it was more about motherhood and about caring for children, and who looks out for a child if its mother doesn’t? It’s hard to piece back sometimes what it was that inspired me because especially with a short story, it’s a little different than a novel that you work on for years and years. And also being such a short story, it was probably a combination of things I can’t really put together again. I had the image of the memorial in my mind and also the responsibility of caring for children. I just had a whim wanting to write something considering what the interior life of a statue would be. SR: In your short story “Melody,” you depict the emotional interplay between a separated man’s present loneliness with the broken history of his marriage. How did you approach the shifting perspectives and timelines? LK: I wrote that quite a long time ago. I do remember it went through many drafts. I think I decided that it would be better with the past and the present juxtaposed rather than through flashbacks. I get tired of that whole construction of “then Tony remembered back to…” and “based on the table reminded him,” like a lot of writers. It’s not at all a unique convention, like a lot of writers I decided to do juxtaposition instead of trying to segway everything. SR: One of my favorite quotes in If a Stranger Approaches You comes from Tony Harmon’s questioning of the invisible strangers hidden in cookie-cutter houses: “Tony Harmon would have given anything to be able to walk into one of those houses and ask a few questions. What’s your life like? Greatest fear? Are you the man (or woman) you thought you’d be? What an incredible relief it would be to know the answers to those questions from just a handful of strangers.” Does your writing act as a way to answer those questions of strangers? LK: That’s what reading serves for me more than writing. The recognition of what’s the same and what’s different about us and the sort of feeling that without reading I really would have no way of knowing, except for my very close friends. Even then, are people telling the truth? Do you ever really know them? When you read, you learn about characters, what their lives are like, what they want, so its a little bit like being able to go in to somebody’s house and ask them about their lives. But then also his feeling of isolation and he’d gotten his whole life wrong, just wondering how other people managed at least to seem not to have. It was part of his character to me. SR: The ending of “Somebody’s Mistress, Somebody’s Wife” was a shock for me and made me completely question my understanding of the story. Can you explain your inspiration for this piece and your goal in crafting it? LK: The ending is an urban legend, of a woman who realizes her dog is not a dog. The whole story is urban legends. I was having fun writing it, incorporating all these urban legends into a story. It was sort of an experiment for me to see how many outrageous shockers I could stick in there and make a story out of. SR: What is your favorite story in If a Stranger Approaches You? Which was your favorite one to write? LK: My own favorite story? The one I put first, Mona, the one about mothers and daughters. I don’t know which was my favorite to write. I really did enjoy writing Melody, even though he was completely different from me, I gained this empathy for Tony Harmon and his situation. That was fun. I worked on that one in fits and starts for years and years. But the one I felt that came out the best was Mona. SR: There are many examples in your poetry and fiction of ending on a question. How does ending on a question in a piece affect your reader rather than ending on an answer? LK: Well I guess I would have to ask my reader that (laughter). I guess when I read poems that end on a question—or which in general are endings that open up rather than close down—the poem tends to linger more. I think a lot of times I start a poem as a way to answer a question and then can’t, finding what we know, which is how impossible that is to do. SR: I enjoy when your poems take ordinary objects and explore them through deeper reflection. “Black Dress” in Gardening in the Dark depicts the stages of life through the permanence of the little black dress in a woman’s closet. What is your approach to writing this poem? Did you start with the image then play with its meaning? LK: The way I start poems usually I mean I do have that in mind like meditation on something like the black dress or gardening in general or a McDonald’s bag with a prize in the bottom of it. And then I’m pretty associative poetry writer so I don’t really sit down and I don’t think to myself “I’m writing a poem now.” Instead I start with an image or an idea and then I just scrawl things out in a notebook then I revise. I sort of figure out what I’m writing about as I’m actually writing. I know that I had the idea spring and the idea of the black dress then I just started writing and the other images came to me; it is a little bit like a meditation on a couple of things. It’s more sort of like my mind is considering them, the way we do when we think, rather than a real determined idea that “I’m going to craft this poem.” But it starts with the image, that’s the original impulse. SR: And then the poem tends to craft itself out of the image? LK: Yeah, when it goes well. (Laughter) Sort of. SR: You mentioned you have a notebook. What is it comprised of? Do you record certain events and images? SR: Do you find you have more successes than failures? LK: Oh no, no, no. Many more failures than successes. When it comes to anything to do with writing. Now I’ve been writing so long that at first I didn’t know this and it takes a long time to figure this out: “oh you know there’s more where that came from” and “tomorrow maybe I’ll write better.” This is even true when you spend three years on a novel and it’s no good, which I have done. When you’re 26 years old or something, you think “my God anybody that would do this is a national tragedy or something.” If you are lucky enough to live long enough, you start something else and keep writing. And plus it’s what I like to do. I’d be totally lying if I said that “I don’t care if I publish or if anyone ever reads what I write.” Even still if I spend a lot of time writing something that never goes anywhere, I pretty much usually enjoy writing it, with one exception. I had one terrible novel writing experience, where I just kept pushing through when I knew it wasn’t going anywhere and I knew it was uninspired. That was a waste of time. That was the only waste of time though. I’ve written other unsuccessful novels that were not a waste of time. Since then I’ve learned, if you really do start to feel like you’d like to start smoking or something, or you would like to get drunk before you sat down to write, it’s probably not going very well. And you should probably just forget it, no matter how much time you put into it. SR: I loved the images you created in your poem “The inner workings,” where it appears one person has control over everything in life. What inspired you to look at a world with limited individual autonomy? LK: Thank you for saying it that way. That’s exactly what the poem is about. This one I can really remember. I lived next door for quite a while to this man who I never really met. The houses were next door to each other and I never really got to know him. But I could see pretty much every night when I pulled up in my driveway that he had some sort of huge lab going on down in his basement. He had all these gleaming instruments and all this stuff going on down there. I never knew what it was. It played on my imagination for a long time and I got this crazy idea that he was a mad scientist or that he was down there creating the whole world in his basement, that sort of thing. So that’s what came back to me while I was writing. SR: In an interview with the Fiction Writers’ Review, you said, “Everything [in writing] has some sort of origin in real life—mine or someone close to me.” Can you please describe how you translate reality into fiction? LK: Well, it’s not so much that’s the inspiration: that something happened to somebody or to me and I decide to write about. I don’t think that’s quite accurate. I didn’t say quite what I meant exactly there. It’s more like when I’m writing things, the only entree I have into writing about an event or experience is to base it on things that I’ve actually either experienced or thought about or known someone who did. I read a true crime story by Beverly Lowry, Cross Over, and it’s about Karla Faye Tucker, who was executed in Texas for the icepick murders. So Beverly Lowry got to know her and Karla Faye Tucker was on speed when she did this and although Beverly Lowry herself has never pick-axe murdered anyone, there’s just a little passage in there where Lowry writes about when she was in college she used to take Dexedrine to keep herself up late at night to continue to study. She writes in there because of that completely benign experience of her own, she could see how Karla Faye could be on speed and pick axe murder someone to death. It was point at which she could intersect her own experience with a completely foreign experience. I feel that way: that some of the milder griefs or mistakes I made make it possible for me to understand larger and more dramatic ones, that you have to start somewhere from your own experience in order to write about someone else’s. The writer has not always experienced things. You have to think to yourself “what is the closest I’ve ever come to something like that?” and “what does that feel like?” To make a very short story long. SR: So it’s taking write what you know to a new level? LK: Yes, there’s only so much you can know or want to know, so what’s the closest you can come to that. SR: In that same interview, you discussed how the compressed length of a short story makes it harder to write: “You write a bad page and the reader turns to the next one, and hopefully forgets about it or forgives you. Not in a five-page short story, or even a twenty-page short story.” How does your process shift between writing short stories and novels? LK: I don’t write short stories very much. Those short stories collected thereI wrote over a very long period of time. My fiction is mostly novel-writing. So I think I can get all that forgiveness. I find short stories a very hard and very difficult form. I love to read short stories. Even when I read a short story that I love I’m not sure that I could tell anybody else why it is successful. I don’t feel that way about poems. I feel that if I look at a poem and I find it wonderful, I could tell other people why I think it’s wonderful. But with short stories, I’m like that just seems like magic. I have no idea how the writer did that, but it works. It makes it pretty hard to write something when you can’t really describe what makes something good. With novels I usually feel the goodness, that it’s very forgiving. That there are many many different ways for a novel to be successful. It makes it easier for me to write. SR: Is there a difference in the way you sit down to write a novel or a short story? LK: Those few short stories that I have written, I think I just thought to myself that I had an idea and I would like to write a short story about it. It’s not long enough or big enough idea for a novel and it doesn’t feel like a poem. But yeah, when I start a novel it really is pretty different. It’s something that I really thought about for quite a while and have a setting in mind and a voice. SR: Shifting to your novels, I love how each chapter of The Raising is told from a different character’s perspective. Would you please explain how you constructed a single, coherent world through these multiple viewpoints? LK: Well thank you for saying that I did. I was just working on that. The main trick I was trying to perform with that novel was to make the different perspectives first of all, matter, and also just work with the idea that everybody had a different story and this would be the way that the whole picture such as it could be, would ever be pieced together. I think I worked on it pretty intensely. Pretty much the way they fall in the novel is the order in which I wrote them. Although I did end up switching things around. It was a little exhausting. It was a lot easier I found writing from one point of view. I really had to devote a lot of time. When writing a novel, I could sit down and work on it for half an hour one day and an hour the next. But with this one, I just knew all the time I was just going totally lose the thread if I didn’t hack away at it pretty constantly. SR: The Raising uses multiple anthropological views of death to add a deeper understanding of the present events of the novel. For example, Mira teaches a college class on village burial customs and their mythical origins, which helps Perry rationalize Nicole’s death. How did you research this subject? What was the most interesting funeral rite or ritual that you found? LK: It was fun to start reading about vampire lore and that sort of thing. You know I’m not sure what the most interesting one I found was. I’ve kind of forgotten the books I read at the time. But there was one about vampires, remnants, and souls or something like that about Eastern Europeans and some of their superstitions of the dead coming back and this conviction, which I find very interesting, that even though we miss our loved ones and we want them to come back, you don’t. It’s a really scary idea to go to the door and there’s grandpa! It seems psychologically non-intuitive, but that’s how it is. SR: So would you say a lot of your research was to gain an understanding of the subject that you integrated into the novel? LK: Yeah, kind of. I teach too. I would think about what lessons there would be in this novel and what scholarly books would one read and come to a conclusion about what people’s ideas about rites and rituals and what their superstitions would be. SR: When reading your works, I found myself becoming quickly attached to characters, even if I only knew them for a few pages. I felt their heartbreak and understood their confusion. What is your approach to creating such powerful characters in so few words? LK: I really appreciate you saying that. It’s hard to answer such a nice compliment. I don’t know that I do accomplish that. I think that it’s a matter of involvement with the characters over a long period of time. And as I said before, or as you said, from that other interview, that on some level, they’re all me or somebody I know. I’m not just inventing characters that have nothing in common with. If I’ve accomplished that, then that’s why. It’s because just thinking of real people I know. SR: So your personal attachment to your characters is what I see when I read your works? SR: On your University of Michigan biography page, you say, “There's no such thing as too much passion when it comes to making art or responding to it.” How is passion embodied in your writing process? LK: I do feel that way. I guess in some ways I say that more like as inspiration for students to think “ok, we’re really going to devote ourselves to this and get excited. If we argue we’re not going to feel bad about that, because we want to have, and we do have, strong opinions about this.” That part of at least continuing to write through a lifetime, is really deciding that it’s magical, that it’s sacred. I myself have never liked the whole idea of “craft” and the whole writing process seems much more supernatural to me than that. I guess that I don’t always, everytime I sit down to write, feel that I am having a supernatural experience. But I write much better when I’m thinking of it like that than when I’m thinking about mechanics and outlines and what other people think of my writing. Even if nobody reads this poem that I sit down to write, it really matters because it matters to me. LK: Oh, I’m sitting in it right now. There’s laundry all over the floor and it’s very dusty right now. I just finished a project so for once my desk is kind of clean. But it’s a mess. It’s just a mess. But I’ve got my cats in here and I’ve got a bunch of pillows on the floor for the cats and lots of books. Coffee cups I should probably take back to the kitchen. It’s a mess. It’s a work in progress.